from the Grand Coulee Area's Best Vantage Point. Rufus Woods and the Majesty of the Great Grand Coulee. ancient river channel Carved by the Glacial Columbia. The Clearly Marked turn off will be on your Right. 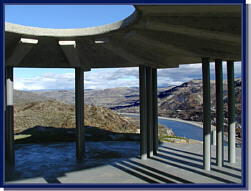 Crown Point Parking and View Area. 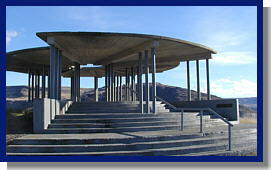 is the Large Covered Concrete Observation Point. This Circular Structure is Actually a Huge Sun dial. points due North, down river. 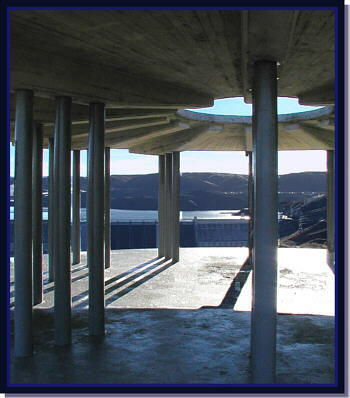 Before your Journey to the Grand Coulee Dam. drive from downtown Grand Coulee. and please stay in designated areas. Thank-you. Crown Point can be found easily from the Eastern side of Coulee Dam. Look along the top of the West Coulee Wall, about a Mile Below the Dam.